Before a meeting with his Cabinet on Monday, the president said intelligence assessments are underway and his administration will be making "some major decisions" on Syria over the next 24-48 hours. He later said a decision could be made "by the end of today." When asked about possible U.S. military action, Trump said: "Nothing's off the table." “You don’t see things like that, as bad as the news is around the world, you just don’t see those images,” he said. “This is about humanity and it can’t be allowed to happen,” he said. “If it’s the Russians, if it’s Syria, if it's Iran, if it’s all of them together, we’ll figure it out." 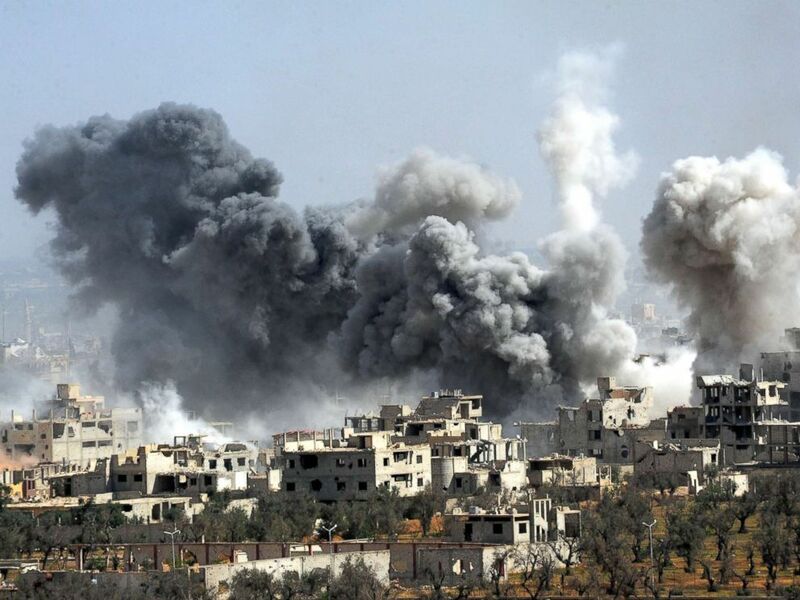 Smoke rises after the Syrian army's shelling targeted the Douma district in Eastern Ghouta countryside of Damascus, Syria, April 7, 2018. Asked if Russian President Vladimir Putin bears responsibility for the attack, the president said "he may." "He may, yeah, he may, and if he does, it's going to be very tough," Trump said. "Everybody's going to pay a price, he will, everybody will." Just over a year ago, another chemical attack in Syria prompted Trump to order a cruise missile strike on a Syrian military airfield shortly learning about the attack. At the time, Trump called it “a brutal death for many” and expressed horror at the images of injured and dead children. 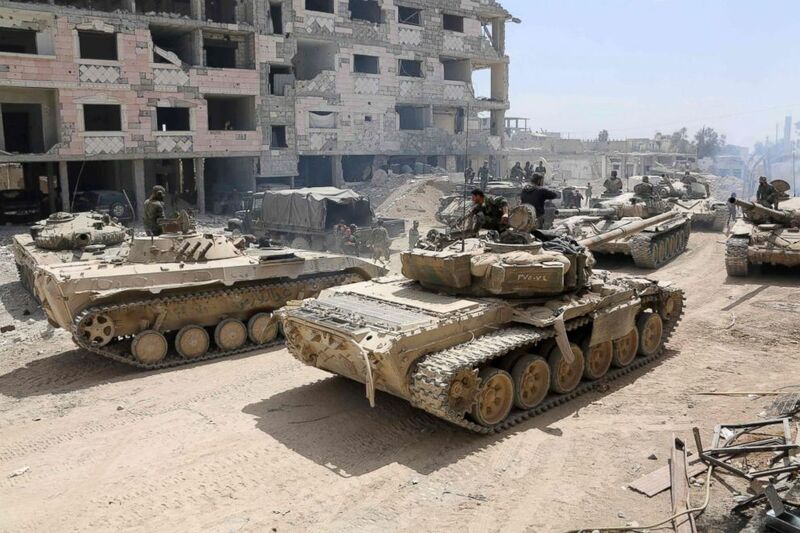 Syrian Army soldiers gathering in an area on the eastern outskirts of Douma, as they continue their fierce offensive to retake the last opposition holdout in Eastern Ghouta, April 8, 2018. 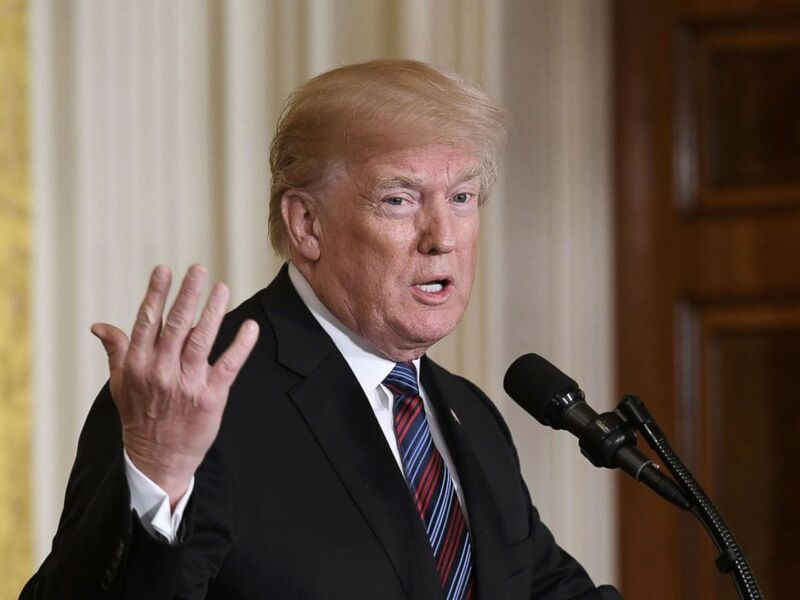 Days earlier, during a press conference with Jordan’s King Abdullah II, Trump began his remarks condemning the “heinous actions” that left at least 72 people dead. He was asked if that attack crossed a red line for him -- a reference to President Barack Obama’s 2012 threat that Syria's use of chemical weapons would cross a "red line." President Donald Trump speaks during a joint press conference with three Baltic States (Estonia, Latvia and Lithuania) in the East Room of the White House, April 3, 2018. The president's third national security adivser, John Bolton, was in the room when the he made his comments Monday. 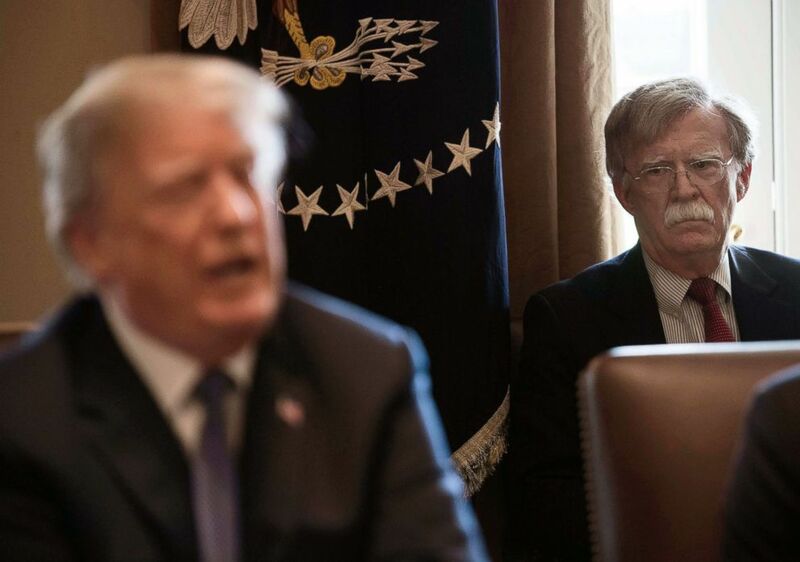 New National Security Adviser John Bolton, right, listens to President Donald Trump speak during a cabinet meeting at the White House in Washington, D.C., on April 9, 2018. Bolton, who began his new role at the White House on Monday, referred to President Trump’s 2017 strike as “strong decisive action” on Twitter. In a subsequent op-ed in the U.K. Post, Bolton declared Trump’s action served as the end of the Obama era in American foreign policy. ABC News' Jordyn Phelps contributed to this report.